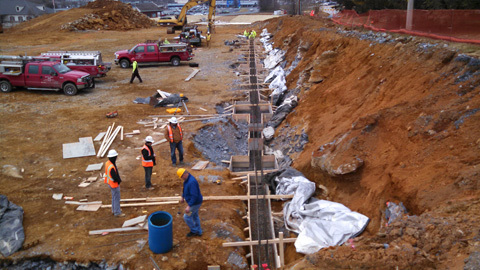 We offer foundation excavation and installation for commercial clients of all sizes. When our clients use us as their sole concrete contractor, it streamlines the construction process. We handle many projects small and large projects alike, including warehouses, hotels, department stores, offices, and convenience stores. We have all the necessary equipment to excavate foundations per your plans, install all required reinforcing, and place concrete foundations for your building. We also offer backfilling and site grading along with this service as necessary. Our foremen in the field are detail-oriented and skilled in reading construction blueprints in order to layout building foundations.